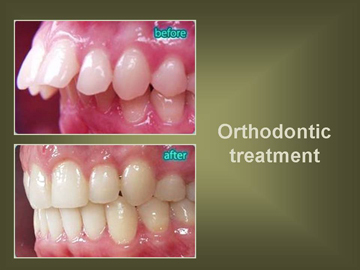 Orthodontic Treatments. Z Dental Group - Beverly Hills Dentist, Los Angeles Dentist. Orthodontics, orthodontia, or orthodonture (from Greek orthos "straight or proper"; and odous "tooth") is the first specialty of dentistry that is concerned with the study and treatment of malocclusions (improper bites), which may be a result of tooth irregularity, disproportionate jaw relationships, or both. Orthodontic treatment can focus on dental displacement only, or can deal with the control and modification of facial growth. In the latter case it is better defined as "dentofacial orthopaedics". Orthodontic treatment can be carried out for purely aesthetic reasons with regards to improving the general appearance of patients' teeth. However, there are orthodontists who work on reconstructing the entire face rather than focusing exclusively on teeth. For comprehensive orthodontic treatment, most commonly, metal wires (Juste) are inserted into orthodontic brackets (dental braces), which can be made from stainless steel or a more aesthetic ceramic material. The wires interact with the brackets to move teeth into the desired positions. Other methods may include invisalign. Invisalign consists of clear plastic aligners that 'level and align', but require more patient compliance than traditional braces. Dental braces, with a powerchain, removed after completion of treatment. Additional components: including removable appliances ("plates"), headgear, expansion appliances, and many other devices—may also be used to move teeth and jaw bones. Functional appliances, for example, are used in growing patients (age 5 to 14) with the aim of modifying the jaw dimensions and relationship if these are altered. This therapy, termed Dentofacial Orthopedics, is frequently followed by fixed multibracket therapy ("full braces") to align the teeth and refine the occlusion. Hawley retainers are the most common type of retainers. This picture shows retainers for the top and bottom of the mouth. Orthodontics is the study of dentistry that is concerned with the treatment of improper bites, and crooked teeth. Orthodontic treatment can help fix your teeth and set them in the right place. Orthodontists usually use braces and retainers to set your teeth. There are, however, orthodontists who work on reconstructing the entire face rather than focusing exclusively on teeth. After a course of active orthodontic treatment, patients will typically wear retainers, which maintain the teeth in their improved positions while surrounding bone reforms around them. The retainers are generally worn full-time for a short period, perhaps six months to a year, then part-time (typically, nightly during sleep) for as long as the orthodontist recommends. 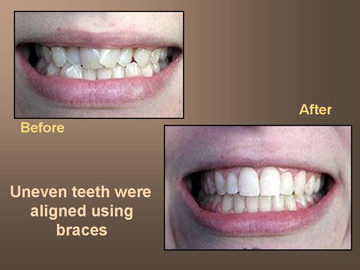 It is possible for the teeth to stay aligned without regular retainer wear. However, there are many reasons teeth will crowd as a person ages, whether or not the individual ever experienced orthodontic treatment; thus there is no guarantee that teeth will stay aligned without retention. For this reason, many orthodontists prescribe part-time retainer wear for many years after orthodontic treatment.